Truth be told, I didn’t have an engagement party after my now hubby proposed back in 2012. The stress of planning a party (or relinquishing it to my offering parents), putting together a guest list, escaping the nightmaring feeling that we were bragging about our new fiance roles, getting gifts (and needing to send thank yous, I’m notorious for writing sentimental novels, and I wasn’t game for carpal tunnel so soon after he put a ring on it), it all seemed very extra to me. 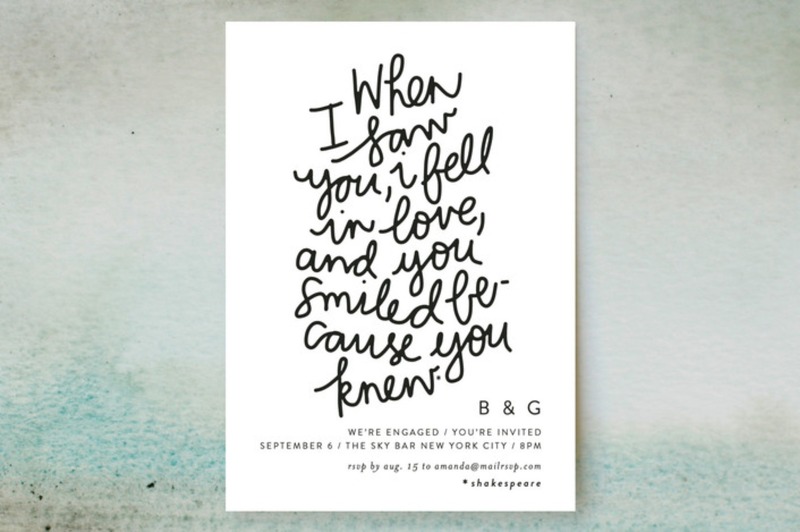 Now, having been invited to a few lowkey, yet totally classy engagement soirees, I’m bummed we didn’t do it. It’s your coming out party, and it’s an occasion that should be celebrated with all the necessary fanfare and accoutrements. Especially if (like myself) you’ve been together for a bordering-common-law length of time, being able to squash all the ‘when are they getting engaged?’ ‘he hasn’t proposed yet?’ gossiping with a ‘YES, we’re making it official, at long last’ party is extremely satisfying. You almost want to have an engagement party solely to shut down all of the chatter and will they-won’t they whispering surrounding your relationship. But alas, I digress. Having a party to commemorate such a special time in your life is not only acceptable, it’s encouraged. When else can you scream from the rooftops that you’re marrying your best friend and you don’t care who knows it? Everyone needs to have that Monica shouting from her Manhattan balcony, “I’m ENGAGED” (to Chandler) moment. Don’t lie. You’ve dreamed about it yourself. Plus, these days, engagement parties don’t have to be an over-the-top event. Whether you want to keep it simple and understated, perhaps with just a delicious dinner party or would rather let your future bridal party step in to throw you the sassiest stock the bar party, you have endless opportunities to tailor-make your perfect night. All this being said, if you’re still not convinced a party is right for you, just take a peek at these Minted engagement party invitations. Sometimes, just imagining your names dropped into a decked-out design can do the trick. And from modern to preppy, vintage to bohemian, there is no shortage of style to be found. We’ve rounded up just 10 of our favorites, but make sure you scan the entire curated collection. Oh, and remember, all can be customized with photo backers, so if you have a few favorite photos from over the years, or even a couple candids from the night you said ‘YES,’ make sure to share! !